Leonard James was born on 10 March 1896 (birth certificate number 1896/14360) in Te Kopuru in the northern Kaipara region. 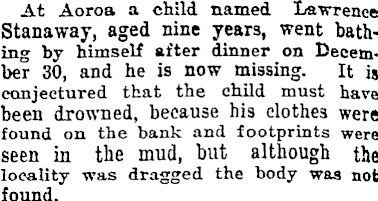 On 30 December 1903 in Aoroa, aged 7 years and 10 months, Leonard dies – the verdict of Jury was “accidentally drowned”, he was buried on 3 January 1904 at Oturei Native Cemetery (51 Te Tuhi Road), Northern Wairoa, Kaipara (Death Certificate number 1904/590). Aucland Star 5 January 1904.